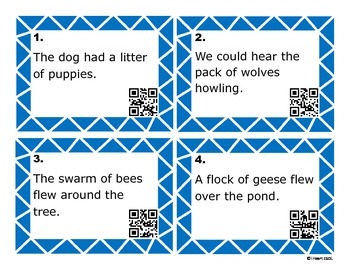 This product contains 20 task cards with QR codes where students will find the collective noun in a sentence. A recording sheet and answer key are also included. Some examples of the collective nouns include: herd, flock, team, colony, litter, bunch, etc. Task Cards: Use in a center, small group, or as independent work. 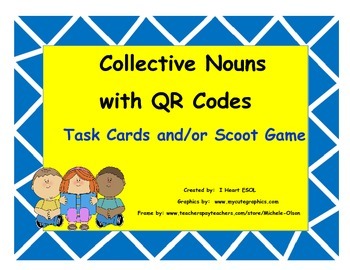 Students can read the sentence on the task card, find the collective noun in the sentence, and write their answer on the recording sheet. Check individual recording sheets or check as a whole group. Scoot Game: Place a card on each student’s desk. 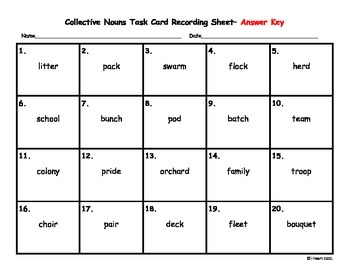 The student will find the collective noun in the sentence and write the answer in the box on the recording sheet. When the teacher says to move, students will move to the next desk and answer that question. Keep moving until all answers are filled in on the recording sheet. QR Codes: Students can scan the QR code on the card to check their answers once they have filled out the recording sheet. You will need an electronic device with a QR code reader to scan the QR codes. 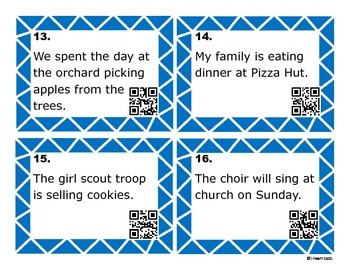 Please visit my store for other QR code and task card activities.